The request for smaller trees in the landscape is becoming more popular. There is a litany of reasons for customers purchasing smaller trees, the most popular of which is landscaping smaller lots. In today’s neighborhoods, the average lot does not have enough space to support several large trees like maples and oaks. Many small trees are also used as specimen plants, accenting certain areas or corners of the landscape. Color is always a popular reason for choosing these plants. Many species like dogwood, redbud, and cherry will add a splash of color to the garden in the spring months. If you like maples but do not have the space available for a full-grown red maple, consider trident maple (Acer buergerianum). Trident maple can mature to a 30’ X 30’ tree with a beautiful rounded form. Its tri-lobed lustrous green leaves turn to a vibrant golden yellow in the fall months. Japanese maple (Acer palmatum) is one of the most revered trees in the landscape for its form, texture, and color. 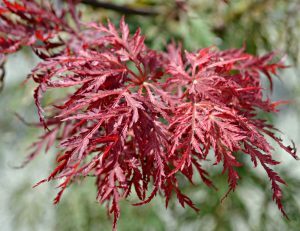 There are many different cultivars of Japanese maple available on the market today, all adding unique characteristics to the landscape. Choices can be made between upright and weeping forms, broad leaves or fine textured leaves, and multiple leaf color choices. Many of our native understory trees are perfectly suitable for use in the landscape. Most of these trees are indigenous to areas under the canopy of large hardwood trees in forested areas. Two of the most popular in this bunch are the native flowering dogwood (Cornus florida) and eastern redbud (Cercis canadensis). Both of these trees will mature to heights and widths of approximately 20’. Dogwoods need no introduction with their large distinct white or pink flowers. In the fall, the color of dogwood foliage is absolutely brilliant, adding another season of interest. 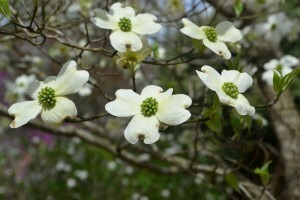 If you are a dogwood fanatic, kousa dogwood (Cornus kousa) should be added to your list of trees to plant. 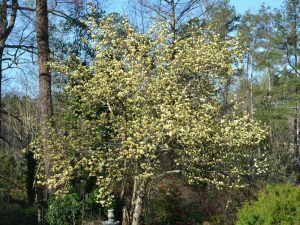 This Asian relative of our native dogwood blooms in May rather than April, extending the dogwood season. Fruit that resemble strawberries adorn the tree in the fall. Redbuds are often one of the earlier trees to flower in March. Their dark purple flowers make bold statements during early spring days. Large, heart shaped leaves add interest in the summer and fall months. Flowering cherries are hard to beat for their incredible floral show in the spring months. Three popular choices of cherry are yoshino cherry (Prunus x yeodensis), kwanzan cherry (Prunus serrulata), and weeping cherry (Prunus subhirtella ‘Pendula’). 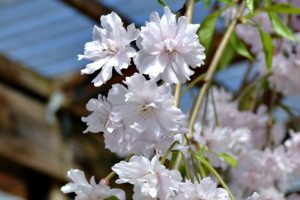 Yoshino and kwanzan cherry can both attain heights and widths of 20’, while weeping cherry can reach 12-25’ in height and 15’ in width (depending on cultivar). For several weeks in spring, these trees are flowering machines that demand attention in the garden. White flowers with a dappled blush pink throat cover the branches on Yoshino while pink carnation formed flowers can be found on Kwanzan. Weeping cherries can flower in either pink or white, depending on which cultivar is chosen. Two magnolias can also be utilized in small areas. ‘Little Gem’ is a cultivar of our native evergreen southern magnolia (Magnolia grandiflora ‘Little Gem’) that was selected for its small stature, dark green foliage, and flowering ability. ‘Little Gem’ will mature to a height of 25-30’ tall and 10-15’ wide. Similar to the traditional southern magnolia, large lemon scented white flowers appear during the summer months. Saucer magnolia (Magnolia x soulangiana) is a deciduous Japanese relative that can achieve heights of 15’ and widths of 8-10’. As one of the earliest flowering trees, saucer magnolia seems to awaken the landscape in March with large purple or pink tulip shaped flowers. Crepe myrtles (Lagerstroemia indica) should not be left out of the discussion of small trees in the landscape. 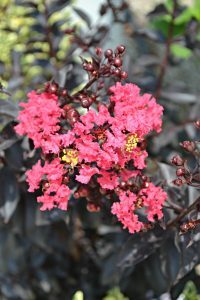 There are not many other plants that can add the four-season beauty of a crepe myrtle with the ease of growth you receive with these plants. A long flowering season in the summer, combined with beautiful form and unique exfoliating bark make these plants worthy of attention year round. Colors range from white to lavender, red to a myriad of pinks. Most of the larger crepe myrtles available have a graceful vase shape form with the outer most portions of the branches possessing a slightly cascading appearance. There are many dwarf to medium sized crepes available so it is important to ensure that a large growing form is purchased to achieve the desired affect in the landscape. Many of the small to medium sized cultivars of crepe myrtle would be too small to constitute a small tree. If these trees do not get your gardening juices flowing, you can also consider tree-forming a large shrub. It sounds like a daunting task, but this is really a simple project. Find a large shrub that attains a height of 12-15’ at maturity. As the shrub gets taller over time, simply prune away the lowest branches from the main trunk. Over a few years, you can easily raise the canopy of wonderful landscape plants like viburnum, holly, cypress, even hydrangea. Small trees have a reputation as being niche fillers in the landscape. These trees are a perfect way to add interest to a forgotten corner of the garden. A burst of early color in the spring, the interest of a weeping form, or the texture of exfoliating bark can add a subtle surprise to any landscape. Add one of these fantastic plants to your landscape today!